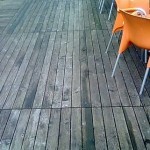 Is your timber decking slippy? Position the decking in a sunny location not in a damp, dark or shaded area. Provide falls to the decking to allow any water to quickly fall from the boards. Regularly clean and protect the timber. A very dilute bleach wash can be used to remove algae, but remember to wash it off. 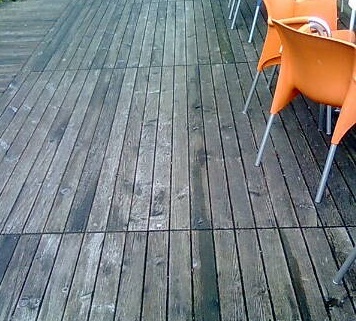 Grooved decking boards. Decking boards can now contain grooves, but these seem to be provided to help water to drain away rather than as most people think to aid grip. While the grooves seem to help with grip when walking perpendicular to the grooves, in my experience when walking in the direction of the grooves they provide less grip then flat boards. This makes sense because there is less timber surface available for friction. In the case of ramps these grooves should ideally be placed at right angles to the ramp direction to prevent slips and falls. Adhesive strips. The best solution to slippy decking is to purchase decking boards with pre-installed adhesive strips, these are more expensive but if you already have grooved decking the strips can be bought separately and be installed afterwards. Decking at entrances and exits. Some people think that grooved decking should be laid so that the direction of the grooves is pointing away from any walls to aid drainage of water away from the property. While this is a reasonable point the consequence of this is that persons leaving the external doors and walking away from the property are then walking in the direction of the grooves and therefore have less grip. Perhaps the best solution is to leave a small gap between the wall and the decking for drainage (along with a fall away from the property) and lay the decking so the grooves are perpendicular to the direction of travel. Extension to Dublins Luas red line open, but is it too long? I think that you will find that the friction force is independent of the surface area of contact. I know this is non intuitive but I seem to remember a physics exp where 2 rectangular blocks of equal mass are placed one on the narrow side and one on the broader side. Both slide down a tilting slope at the same time and rate.